Fly-fishing is one of the most therapeutic activities around, and tenkara’s simplicity perhaps even more so. Since the inception of Tenkara USA, we have been approached and supported numerous organizations that work with war veterans and people with limited arm mobility. Tenkara, with no reel, no unnecessary amount of line to strip, no bells-and-whistles, has proved to be a very effective tool in helping people that would otherwise have difficulties, give fly-fishing a real try. It’s not the only tool around for adaptive angling, but definitely a fun tool that also provides some additional independence to those who want to fish with a fly. A fishing method made for fishing with one hand. Tenkara removes the complexities that were added to fly-fishing over the years and makes it a fun, and above all, simple and intuitive method of angling with a fly. Not having to pass line through the rod guides, strip line to cast, and going through a complicated series of knots, mean that tenkara allows for greater independence in his fishing. Imagine you only have one able arm and want to setup your rod and fish, yourself, for a bit. A rod with a reel by default ask for two hands, frustrating, I’d imagine. As I witnessed, a telescopic tenkara rod is a rod, made for one-handed fishing. It can be held under one’s arm as the plug is removed and the tip is exposed with the able hand; the hand, which in turn quickly makes a girth hitch on hisline and tightens it against the rod tip. And, finally telescopes each segment of the rod out and proceeds to cast, an intuitive cast with no 2-handed stripping needed. These are the few steps needed to setup and fish with a tenkara rod when the fly is already tied on. I was extremely proud to see a tenkara rod, one which I adopted from a foreign country and introduced to the US, serve as much more than a simple fishing tool. 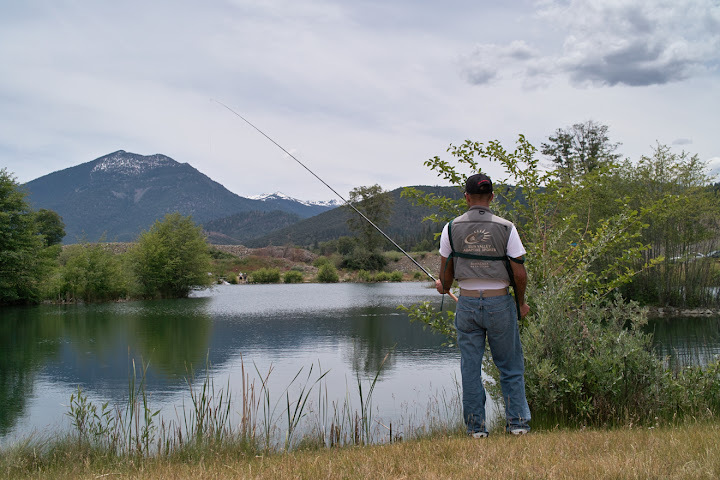 Walking around the banks of this lake, with his western fly-rod already rigged but mostly inside the reel, the war veteran – not only a war veteran but a western fly-fishing “veteran” of 3+ years, who, through a special reel, a special stripping device and some ingenuity – spotted a very good fish. With no time to spare and go through the process of getting his line out of the reel to cast, I gave him my tenkara rod, which I kept rigged for the occasional cast. Not yet fully used to casting with a tenkara rod, his first cast piles up a bit, but it’s no problem, the line is so light the fish was not disturbed. On the second cast the fly didn’t turnover completely, but went far enough, maybe 15ft out, to attract the attention of the feeding fish. In a few seconds it was fish on. A healthy and very feisty 14″ rainbow. Not his biggest, nor his first, but his first on a tenkara rod, maybe the first that provided such a fight he thought he may not actually land it, the first that perhaps felt like an equal adversary. But, also the first fish he had full control over, who didn’t take line, because he couldn’t, and after a very strong fight just surrendered because he realized he couldn’t really run anywhere. He was hooked. The simplicity of it, the fact that he could simply cast when he wanted to, and the won battle – All worth it. A HUGE THANK YOU TO ALL VETERANS AND THOSE WHO SACRIFICE SO MUCH FOR THEIR COUNTRY! Taking some disabled veterans out to Montana this week. Have Tenkara rod, but no knowledge of how to rig. What do I need? Can you help? Thanks for taking your time, hope you guys have a great time.